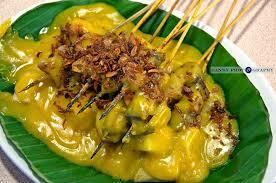 Satay is an Indonesian original dish consisting of small pieces of meat grilled on a skewer and served with a spiced sauce. The kinds of spiced sauce makes the differences of satay such as satay Madura consist of peanut spiced sauce or Satay Padang consist of yellow spicy sauce. bamboo skewers (soak in a water for 20 - 30 minutes so it won't burn when you grill your satay. 1. In a large pot, pour in 8 cups of water or more (make sure it cover the meat). Boil the meat in whole (meaning: don't cut into pieces yet) until half cooked, about 15 until 20 minutes. Skim off any scum as it arises. turn off the heat. 2.In a small to medium size skillet , add about 1 tbsp of vegetable oil, add ground spices and saute until fragrant.Add the sauteed spices into the pot followed by kaffir lime leaves, lemon grass and turmeric powder. Bring it to boil, cover with lid and then lower the heat and simmer until beef is tender ( it may take somewhere from 45 minutes until 1 hour or longer you be the judge. 3. Remove the meat, let cool and cut into chunky cubes.Keep the stock. 5. get your grill ready and brush the satay with some oil on both side and grill until they are slightly browned but not to long so the meat won't thoughen and dried up too much. 6. Season with stock with salt. Bring the stock back to boil. Stir the rice flour again before pouring into the stock to thicken up the stock. Tis is important step or you will end up with lumps. Continue to stir vigorously after that until it is thick and smooth. 7. When ready to serve, pour the sauce over the satay and rice cakes.Sprinkle with fried shallots crips. It is best to serve it while it's pipping hot.